I have this bizarre idea that the harder anything is to find the more beautiful and interesting it will be. Naturally, this is not borne out by experience. I'm perfectly clear that if I want to see unusual plants I'd be better off in botanic gardens than in my local park where tennis courts take precedence over hot-houses. There are some ideas which matter. If I decided to murder three people a day it would have an impact on society and it might be a good idea that I be stopped. But if I want to potter round in dull streets on dull days when it's so cold my hands are shaking with shivering and search for urban wild-plants where there seem to be none instead of heading off for places where I know there will be plenty . . . perhaps you will forgive this eccentricity. Or even recognise in it a spirit of adventure usually lacking in a road of unexceptional suburban housing, along with a spirit of genuine scientific enquiry. My 'spirit of adventure and enquiry' seemed to have come a cropper when I went out on Wednesday lunchtime. (Sporting a woolly hat, not a topee and bare fingers because I'd left my gloves at home.) I seemed to be about to prove my theory that plants are everywhere . . . wrong. It's happened before. I've chosen a street, marched along it brimming with confidence, found the confidence shattered by the lack of wild greenery and then . . . found it in abundance. Or if not in abundance (which it usually is) I've found some physically there. 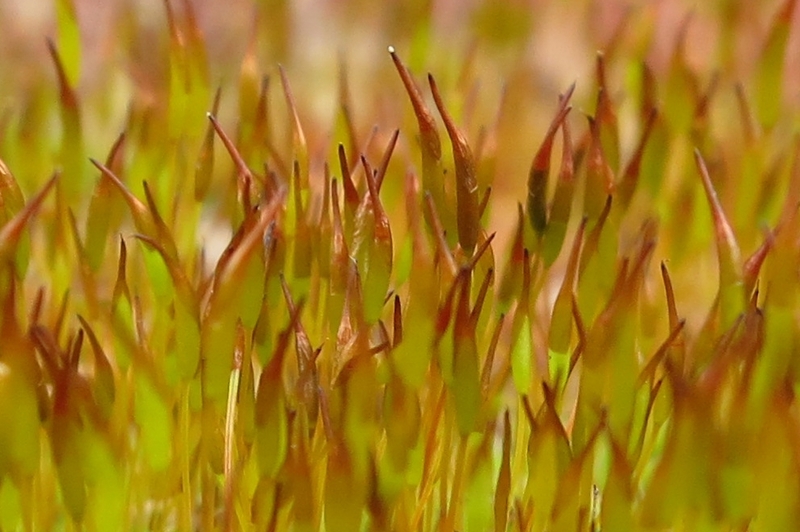 Here's a little grassy lawn. No upkeep needed! I was already composing my post to say 'Sorry, I was wrong, February is an exception,' when I realised I was thinking too large. This was an unsheltered spot; long and straight with the wind blowing in from the side as well as up the middle. 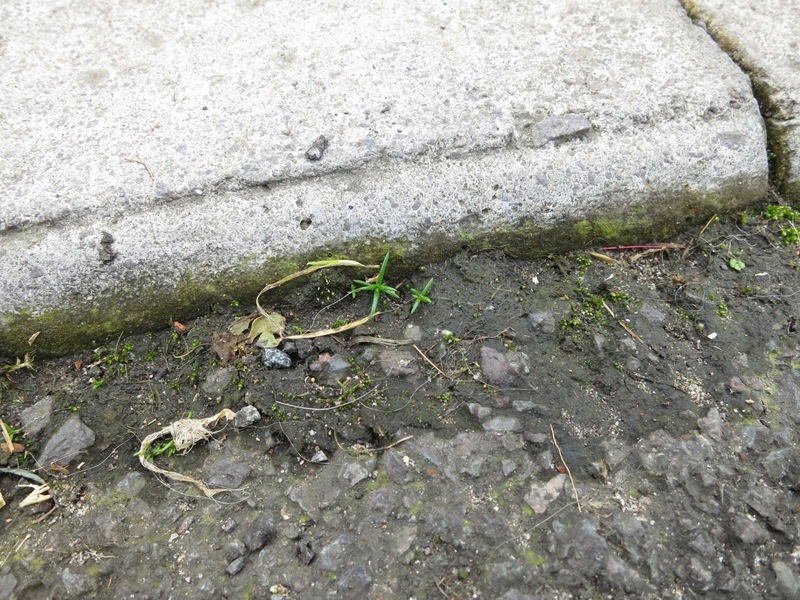 Plants which might have weathered through winter in other places hadn't managed here. The shelter I should be seeking wouldn't be beside waist-high garden walls along the path, it would be right down low in the road. 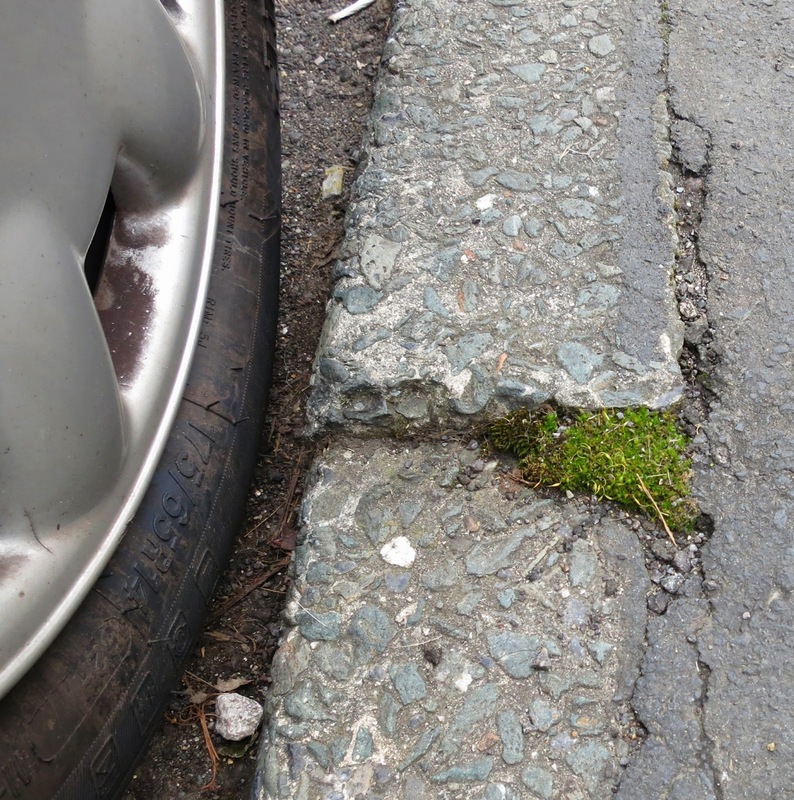 In the Lilliputian / Borrowers world of small plants a kerb is a tall wall. 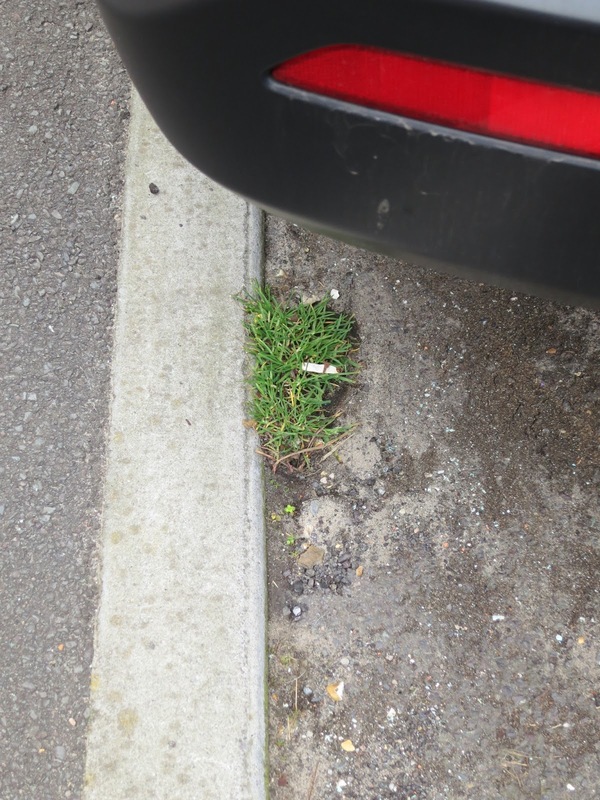 And where cars park, the gap between the wall and tyres becomes a chasm. New motto for the coldest month 'Think Grand. But Think Small'. And another thing. The more time that passes, the more I couldn't care less what plants are called. Their 'thereness' is what enthrals me. Really. If I were to take a photograph of a crowded street, I would expect virtually every human caught in the frame to have an interesting face. But I wouldn't rush up and down asking them for their names. The green blob is not grass - it's a not-very-attractive patch of moss. A prettier specimen comes later in this post. I know, I know, I KNOW . . . we've had this out before . . . that the names of plants matter. And I KNOW that Loose and Leafy is an odd kind of blog and I probably owe it to my readers to find out what things are called so useful information can be recorded and passed on. BUT . . . er . . . I doubt many of you care two hoots either. When it comes to garden plants - that's different. If you see a good one on somebody else's blog, of course you need to know what it is so you can buy one if you would like one in your garden too. But, seriously, no-one is going to read Loose and Leafy and say 'Oh boy! 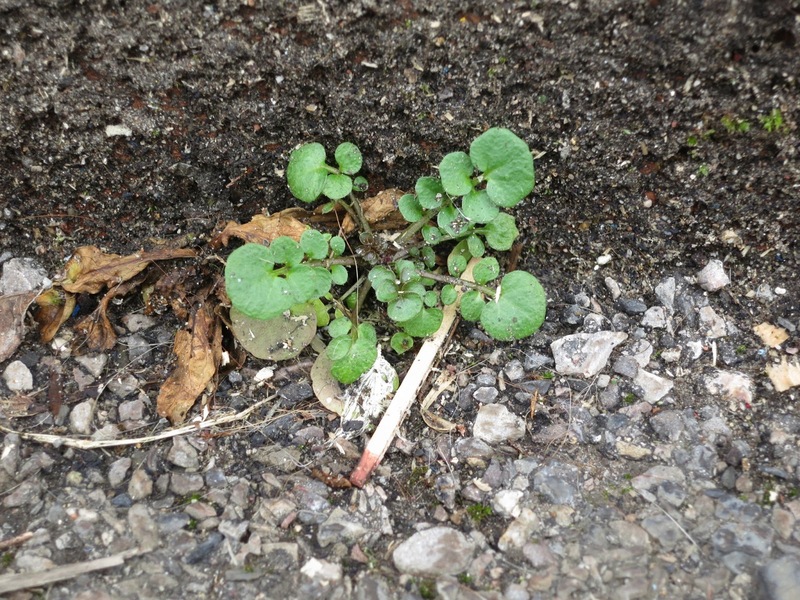 Wouldn't I just like one of those little weeds to plant by my car. I must, I must, know what it is.' Of course not. Though some . . . some are romantic. The Latin name for Common Whitlow grass is Erophila verna - which, roughly translated, means 'This plant loves spring' which is much better than naming it after a sore finger! But as it isn't yet spring in a decidedly 'sprung' sort of way, we'll have to wait for March before I start crawling around looking for that. 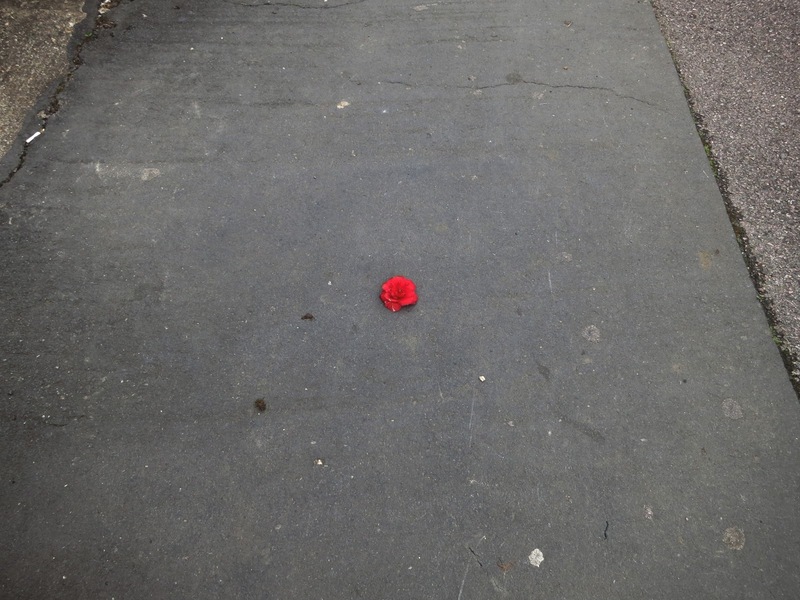 Not a wild plant but the head of a carnation lying in the middle of the path. I've recently come to realise how much my blog is like Top Gear. 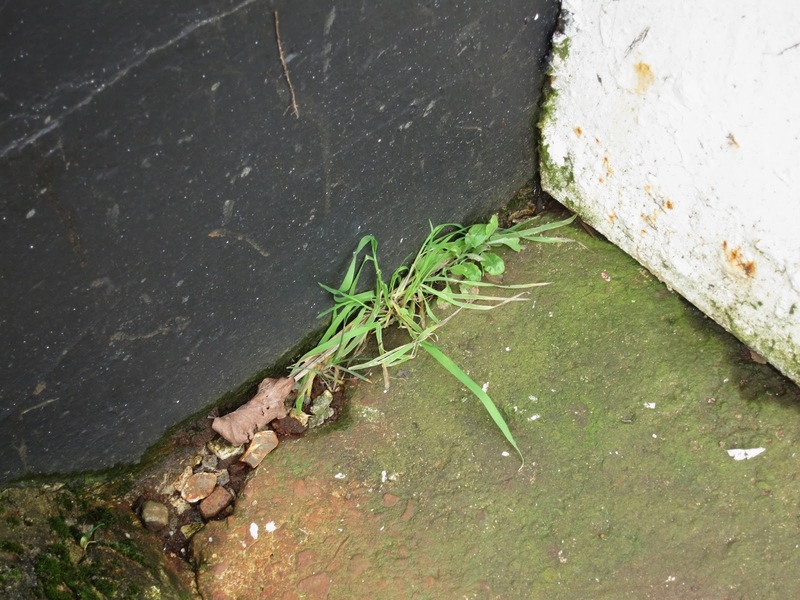 I know in advance that when I show pictures of litter here or my other blog (Message in a Milk Bottle) or fail to give proper recognition to the names of plants - I know someone will (quite rightly) complain about litter or protest the importance of Latin. So I'm feeling rather chuffed. Top Gear is one of the BBC's top income producing programmes (along with Dr Who) and Jeremy Clarkson (the main presenter) was reported to have earned £14 million in 2013. How's that for an example? Would it be fair to conclude the more complaints you receive the more money you'll earn? A good theory. I'm wondering if I might suggest all botanists have sore fingers . . . . and wait for the millions to role in? I love that phrase....forest of wonderfulness. Lucy you are a true plantswoman...appreciative of all plants and your photography, and blog show that. Thank you Jen for such a wonderful compliment. It's nice to see a bit of greenery around in February - even if most folk would call them 'weeds' :) The plant in the top pic is either bittercress or, if it's escaped from a veg garden, could be American Land Cress - a posh name for basically a super-sized version of bittercress, tastes like watercress but doesn't need flowing water to grow. "Forest of wonderfulness" -- an apt description for the moss. It looks like an Impressionist painting. It reminds me of "The Signature of All Things" by Elizabeth Gilbert, an absorbing read about a family of horticulturalists and an emphasis on the study of mosses. Sorry? Did you just say that Jeremy Clarkson's hair was a forest of wonderfulness? 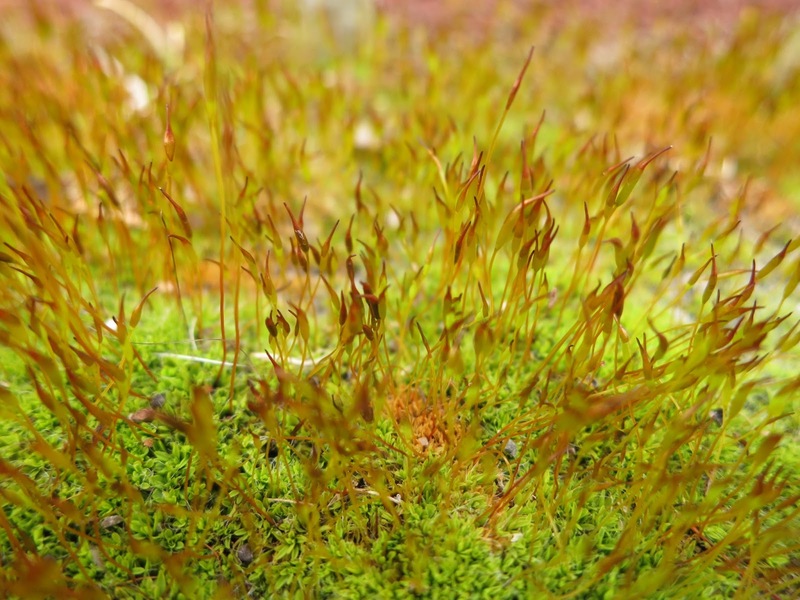 Great post, I to have been looking hard to find some green this month, and you are right about the mosses at the moment, they are looking stunning at the moment. Hello Maryom. Agree about it being a kind of bittercress. At the foot of the page I'd suggested it might be Hairy Bittercress - there's a lot of that round here. I'm glad you mentioned Land Cress because I'd not heard of that before. I looked it up on the RHS site and if I can get some seed might try to grow some in a pot. Hello Liz. One of the good things about screens is that you can use fragments of pictures and blow them up large and they still look good; but if you were to print them they would loose quality. If I had a super-de-dooper lens I'd take a picture like the second one and print it huge and put it on my wall. About Elizabeth Gilbert - I was given an anthology of garden writing by women for Christmas and looked to see if there's an extract in there - only to find no names in the index or contents - you just have to find people by random as you read through. Now, If I ruled the publishing industry . . .
Hello Philip . . . Jeremy Clarkson's hair . . . forest of loveliness . . . I'm mesmerised by the idea. (Awful idea?) Do you watch Top Gear? The staging puzzles me - that all those people go and stand there without necessarily seeing what's going on. What for? But if one were to be there . . . maybe it would be possible to creep to the front . . .
Lucy I do not come to your blog to see the latest plants or what i growing, but more for your incredible creativity in observing what grows around you...I don't mind if you don't name things...I like the way you find them. And I love moss too because when we get up close to it, we see a world lost to us....so keep observing and challenging us! Lovely post! And just because I enjoy Latin names, I don't feel at all insulted by your blog! Each to his/her own way. I'm so glad you like mosses. Me, too. But I find them hard to photograph with the right bits in focus. Keep up the good work. I wish I could say your cheque's in the post!